Discovering that you have a chip or scratch on your windshield can literally ruin your day. It is especially frustrating if you lead a busy and hectic life. This is because the last thing you want to do is take time off of work and time out of your busy day to drive to a windshield repair service and get it fixed. It’s a good thing that you don’t have to go anywhere to get your windshield repaired. That’s right, Suffolk Auto Glass of Long Island will drive to the location of your choice and repair your windshield. This means you don’t have to take time out of your day to get your windshield repaired. Better still, you don’t have to leave work to get this task done. Your local windshield repair company can quickly fix your cracked or chipped windshield wherever you happen to be. There are other benefits to calling a mobile windshield repair service. You save money when you don’t have to drive. If you have the luxury of calling a windshield repair service to drive to your location to make repairs, you don’t spend any more money on gas. Also, you don’t have to burn through paid leave to get your windshield repaired. And if you work for commissions or do piecework, you won’t lose money tending to a cracked windshield. It takes time to drive to a windshield repair shop for repairs. Who has time for that? There are thousands of things you would rather be doing than driving around finding an auto glass shop. With a mobile auto glass service, you can sit in your favorite sushi restaurant downing Philadelphia and dragon rolls while your windshield is being repaired. There is no reason to compromise safety when you can have your windshield repaired right where it is. Damage to your windshield increases safety risks in more ways than you can imagine. The crack or chip in your windshield could be blocking your field of vision. In addition, your windshield provides integral support to your vehicle’s roof. Which means should you crash, you are more susceptible to getting crushed. Don’t put yourself at needless risk. You will like this scenario. You call us and then head into a movie. While you are enjoying a romantic comedy eating Junior Mints and buttery popcorn, your windshield is being repaired. When you emerge from the movie theater, you hop into a car with a windshield as good as new. And all of this happened while you were enjoying yourself. This sure beats taking your car somewhere else and having to sit in a stuffy waiting room with stale coffee a blaring television while your repairs are being made. 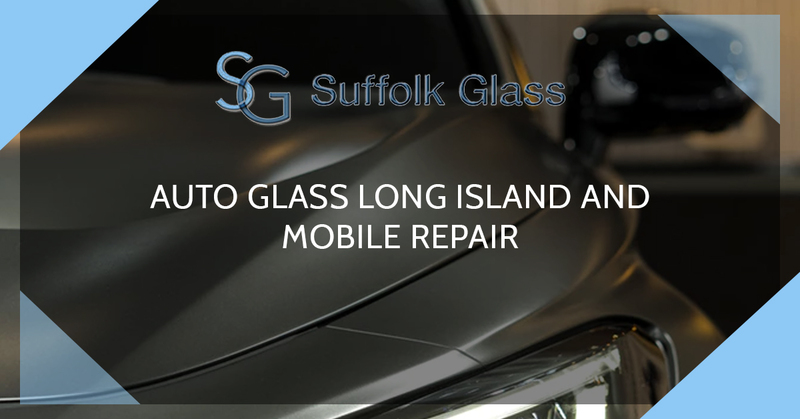 Suffolk Glass is a full-service auto glass shop offering residential, commercial and automotive glass repair in Long Island. We offer fast services, competitive prices and excellent customer service. Contact us today with questions or to schedule an appointment.